Philly’s Avery Sparrow puts all his trust in his promoter IBHOF promoter/matchmaker J Russell Peltz. He is currently No. 14 in the WBO ratings due to a victory over previous No. 5 Jose Lopez. This is what Peltz had to say about his fighter when he was introduced first while fighting an opponent from Nogales, Mexico on the first pro show at Parx Casino in Bensalem, PA, on March 9th. Avery Sparrow never said one word about being introduced first. He never moaned that he was making substantially less money for March 9th than he made for November 30th when he upset Jose Lopez, the No. 5 ranked WBO junior lightweight contender in the world, on ESPN. He never argued that Jesus Serrano, 17-4-2, was not exactly “a walk in the park type of opponent”. He never threatened to pull out when he was 8 pounds over the contract weight 48 hours before the weigh-in. He simply went out there and destroyed a credible opponent in less than 2 rounds to secure his rating with the WBO and hopefully open the eyes of the other ranking organizations. I cannot sit here and tell you that Avery Marcus Sparrow will win the world title but I can tell you that after 49 years in this sometimes wonderful, sometimes rancid business of professional boxing, I am grateful that he believes in me as much as I believe in him. I’m not going to worry if, when the money comes in, that some moron on the street will fill his head with negative thoughts about me. That’s part of the business, but as I head to the top of the stretch of my career, I am enjoying the ride. Sparrow is 10-1 (4) and turned 24 in January. He turned professional in July of 2014 winning his first 4 fight, 2 by stoppage, before losing for the only time in his career so far by DQ in the 6th and final round to Jerome Rodriguez, 6-3-3, in October of 2015. He came back in March of 2016 to score a first round knockout in Dubai Night Life in Charlotte, NC. 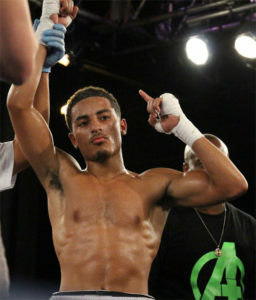 Sparrow didn’t fight again until March of 2017 when he was pitted against one time Philly prospect Anthony Burgin, 10-2, when he won an 8 round split decision. In June he was up in The Sands in Bethlehem, PA, defeating Isaelin Florian, 6-0, of the DR and Reading, PA. In September he was put in with another 6-0 boxer named Joey Laviolette from Nova Scotia, Canada who he defeated by majority decision in 8 rounds. Two months later he defeated Lopez, who was 19-1-1 (14), at the MGM National Harbor, in Oxon Hill, MD. This put him into the WBO Super Featherweight ratings. In December of 2015 Peltz took Camden’s Jason Sosa who was 18-1-3, on a trip to a world championship. Sosa only had one 10 round bout prior to this. Sosa was pitted with Nicholas Walters the WBA World Super Featherweight champion who Sosa drew with in a non-title bout. In his next fight in June of 2016 Sosa defeated Javier Fortuna in Beijing, China, for the world title that Walters had given up. Will Peltz lead Avery Sparrow to a world super featherweight title the same way? Only time will tell!